May Blossom: Hoops! Hoops! Hoops! What a great way to display pieces of your favourite fabrics! I have seen many other people do this before, the result can be stunning. 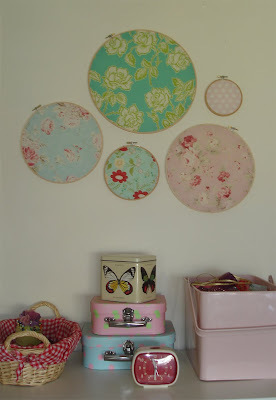 I have just started with hoops I had in the cupboard, left over from my cross stitching days, and chose a few of my many favourite fabrics. I hope to add to the collection over time, hopefully one day my studio wall will be ablaze with colour and texture! Great idea!! whoever thought of this first, I am very impressed.